One of the most popular dishes as Shokudo is their Honey Toast dessert. 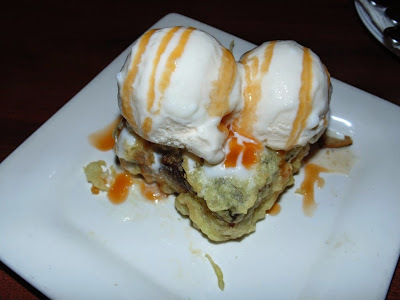 Recently their chefs put a twist on it and now bring you Tempura honey toast bread pudding in sake caramel sauce with vanilla ice cream. Its an even more decadent version and you must drop by to give it a taste. Its the perfect way to end a meal and is their current special. Hopefully it makes it to their permanent menu. This entry was posted on Thursday, July 17th, 2014 at 12:23 am	and is filed under Feature, CityPhoto, Food, cultural, Hawaii Photo of the Day. You can follow any responses to this entry through the RSS 2.0 feed. You can leave a response, or trackback from your own site.